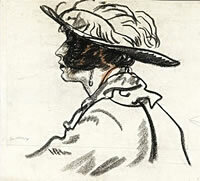 Painter, designer and illustrator, born and died in London. Following his father's profession of silversmith at first, Spurrier studied during the evening at Heatherley's School of Fine Art, then at the Gilbert Garett School. From 1900 he became a full-time illustrator, working for such publications as Black and White, The Graphic, Illustrated London News and Radio Times. During the World War I he worked on camouflage of ships for the Admiralty. Exhibited with the RA from 1913, elected RA 1952. He was a member of the PS, 1922-38, showing almost every year. Also showed at RBA, ROI, RSA, Goupil Gallery and RHA. He wrote Black and White and Illustration in Wash and Line. Work held by Tate Gallery, Victoria & Albert Museum and provincial galleries. John Benison, the designer and artist, was his son. In 1993 a show at Paisnel Gallery highlighted Spurrier's interest in circus and theatrical subjects.